American as it may be, the caloric price of applie pie can be a steep one to pay. I've cut calories dramatically by packing all the appley goodness in a warm handheld vessel. * Flour a work surface. Roll the puff pastry into a 9" x 15" rectangle. Cut the pastry into six equal squares. * Bring the water and sugar to a boil in a saucepan. Peel and core the apples; cut them into 1/4" chunks. Toss with the cinnamon, ginger, nutmeg, and lemon juice, then add to the water and simmer until the liquid thickens, 5 to 7 minutes. Set aside to cool. * Preheat the oven to 425°F. Spoon 3 tablespoons of apples onto each of the puff pastry squares. 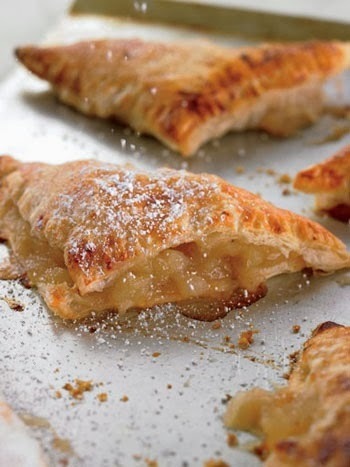 Fold the pastry over the filling to make a triangle and seal by pinching the edges. * Place the turnovers on a baking sheet and brush with the egg white. Bake until crispy and golden brown, 12 to 15 minutes.